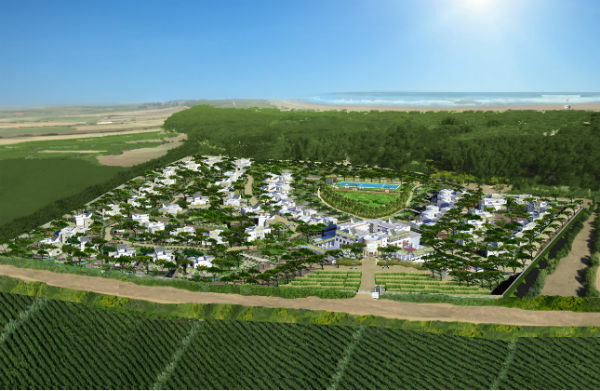 Located to the south of Casablanca, less than 45 minutes by car and 60 minutes from the international airport, the proposed Azem Bay residential development will be the first sustainable bioclimatic resort in Morocco. The resort will consist of a Country Club with 25 apartments and 56 residential villas, with direct access to the adjacent 900ha forest and 1.8km wild sandy beach. The Club will have a spa with heated swimming pool, fitness, hammam, sauna, as well as a children’s club and restaurants, with many sports (equestrian, kite surf, beach volley), cultural and social activities at hand. The GreenAsia Group team, Professor David Strong and Victoria Kate Burrows, established Baseline Performance for all building types by modeling typical construction standard in Morocco. This allowed comparison with several scenarios of progressively enhanced specification based on established best practice to determine the optimum solution in terms of reduced energy consumption. The baseline modelling established that a significant amount of energy would be required for heating and cooling to maintain comfortable conditions throughout the year. Modelling indicates potential for significant operational cost savings through recommendations made, which included enhanced thermal performance of the building fabric, and more efficient servicing strategies. Should the developer follow the recommendations made, projected energy savings are expected to be up to 91% for cooling and up to 89% for heating, with a further 30% reduction in lighting loads and 70% reduction in hot water demand. Further, as a quote from Youssef Benamour, Directeur Général – Managing Director of Earth, The GreenAsia Group is the right partner for sustainable construction. The team is world class, and dedicated to excellence in building. © 2019 The GreenAsia Group. All Rights Reserved.